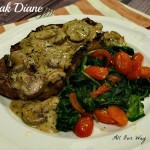 This Steak Diane recipe is a speedy version of the classic dish that was the rage in the 50's and 60's. The meat here is grilled and the sauce is made separately. 2 New York strip steaks 8 oz. each, room temperature, trimmed and seasoned with salt and black pepper. In a pan over medium-high heat ,saute the mushrooms, shallots, and pepper flakes in butter until mushrooms are golden and the moisture has evaporated, about 5 minutes. Deglaze with the vermouth scraping up any brown bits; cook until nearly evaporated. Stir in the stock with the 2 teaspoons minced rosemary, Dijon, Worcestershire, and any steak juices that may be on the plate; simmer until reduced to about 3/4 cup. Whisk the sour cream and cornstarch into the sauce and reduce the heat to low. Simmer sauce until thickened; season with salt and pepper. * You can also make it inside by searing the steaks in 1 Tablespoon olive oil and 1 Tablespoon butter in a cast-iron skillet over medium-high heat until medium-rare, about 3-4 minutes per side. Transfer steaks to a plate and tent with foil to keep warm. Proceed with the sauce as above.